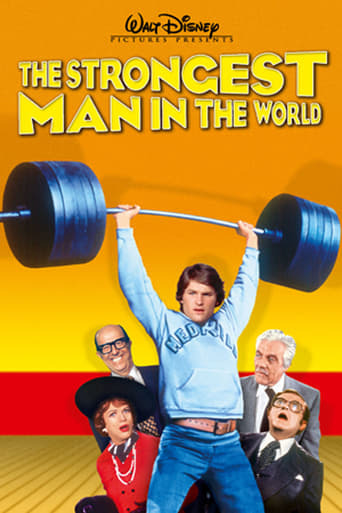 The Strongest Man in the World is a 1975 film starring Kurt Russell as Dexter Riley, a student in the fictional Medfield College. A school laboratory accident mixes one student's vitamin cereal mix with Dexter Riley's chemical experiment. The students decide to dispose of the mess by giving it to their neighbor's cow, with unintended consequences: the cow begins producing an extraordinary amount of milk! When they try it out on themselves, they discover that the mixture gives any human superhuman strength for a few minutes. The school sees this as the thing needed to save their school from closure, but a competitor learn of this deal, and hires two criminals to stop it.This is the third and final film in a series of comedies, which depict the adventures of perpetual college student, Dexter Riley. It follows the 1972 film, "Now You See Him, Now You Don't," and the 1969 film, "The Computer Wore Tennis Shoes."